Ultimately the film glosses over the real messiness of old age, sticking to an upbeat, cheery take on ageing. To be fair though, they never claimed they were making Michael Haneke’s Amour. 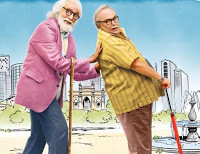 Despite its many shortcomings 102 Not Out has its heart in the right place, and a pair of actors clearly enjoying themselves on screen. Their infectious energy alone makes this film worth a watch. I’m going with three out of five. 102 Not Out’s heart is firmly in the right place. The film knows its territory and the emotions it wants to evoke. It’s just that a few important characters don’t get enough play and they are sacrificed to make space to Amitabh Bachchan and Rishi Kapoor.But are the two veterans worth it? Definitely. They form the soul of 102 Not Out and its youthful exuberance. Rishi Kapoor has an upper hand though.The film’s 101-minute duration is enough to convey its high spirits and liveliness. Its message is loud and clear though it comes at the cost of some unnecessary villainy. What a joy to watch two fantastic actors working in tandem in a performance-oriented film! What’s Good: Not a single dull moment throughout, proper mixage of humour and drama, full of life performances by Amitabh Bachchan, Rishi Kapoor & Jimit Trivedi.What’s Bad: Even if I live for 102 years and watch this movie 102 times, I’ll not be able to pull out anything bad from it.Loo Break: Not a loo break, but many a times you’ll feel to take a break from heart-melting emotions going on-screen.Watch or Not? : The moment I met my dad after watching this movie, I asked him to reschedule whatever he’s having on Friday because we’re watching this together! 102 Not Out never shrugs off the feeling of made-for-stage or garbled, lost-in-translation Gujarati texture.Not many people, and virtually no woman, inhabit its garish frames outside snickering Bachchan, snarling Kapoor and a surprised Jimit Trivedi (wearing a consistently alarmed expression) as the sympathetic pharmacy hand at their beck and call.Every single gesture is overdone and extra boisterous like Bachchan’s inflated exuberance and screaming prosthetics, reminiscent of the 1970s when he’d masquerade as a grey-haired old man playing to the gallery. It was phony, but so much fun.This one’s more 102 and not quite. The film’s plot is based on a Gujarati Play by the same name. 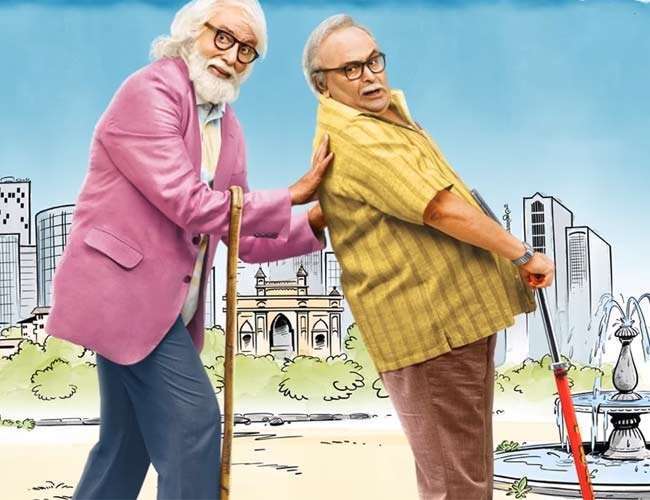 Amitabh Bachchan will play a 102-year-old man and Rishi Kapoor will play his 75-year-old son. The plot revolves around the 102-year-old man trying to break the record for the oldest person in the world, held in the movie by a Chinese Man.